The Pest Pros, LLC offers two distinct ways of treating termites in and around your home. One option is Termidor, and the other is the baiting system. Read on to discover the differences. Termidor is a new type of termite control. It has passed the strictest tests that U.S. and foreign officials have challenged it with. Termidor has consistently proven 100% effective, whenever and wherever it was used. The active ingredient in Termidor is fipronil, and it works quite differently from other active ingredients. Many termiticides are repellents and are applied as a barrier. A barrier might keep termites away, but it won't kill them. If there is a gap in the treatment, the barrier effect fails, and the termites get through. Termidor, on the other hand, is not a repellent. Termites cannot detect Termidor, and thus it completely eliminates the colonies in 3 months or less. Since they don't know it's there, they roam freely in a treated area. The 100% effective results begin here. Termidor kills termites in two ways. First, it kills them when they ingest it. Secondly, and unlike all other termiticides, Termidor is lethal by contact. Thus, the termites don't even have to ingest it to die from the effects. When a termite has been exposed to Termidor, it will unknowingly pick it up and carry it back to the colony. Every other termite it encounters will then itself become a carrier, contacting and affecting others. The fipronil in Termidor is slow-acting and allows the termite to continue its normal routine before dying; the termite stays active long enough to transfer the termiticide to a large number of other termites in the colony. This "transfer effect" (which is unique and puts Termidor in a category by itself) routinely provides 100% termite control in 3 months or less. Termidor is successful at very low application rates. Typically, the solution contains only 0.06% of the active ingredient, fipronil. Also, Termidor bonds to the soil, so there's no leaching through rainfall or irrigation. It's is virtually odorless, as well. Termidor eliminates termite colonies up to 6 times faster than bait systems, which can take from many months to many years to solve a termite problem. The second method for treating termites is the baiting system. It is not nearly as effective as Termidor, but baiting can be an option for houses with certain structural restrictions, that do not permit the use of Termidor. Baiting has no mammalian toxicity and is completely safe. The first step of using is the installation of in-ground stations around the house or building. The stations are lined with non-toxic wooden slats called interceptors, which are a potential source of food for termites. Following this procedure, our trained technicians check the stations on a basis (except December - February, when the ground is snow covered or frozen) to measure and ensure progress. It is impossible to determine how long it will take for the termites to find the stations; it can be as fast as one month, or as long as a year or more. When live termites are eventually found in the stations, the technician adds Termite Bait. The termites begin to feed on it, and the results are imminent. Termites have an exterior skeleton referred to as an exoskeleton. As they grow, they must shed their exoskeleton to form a new one. This process is called molting. New non-repellant insecticides allow an exterior treatment to the foundation and to the soil adjacent to the structure. The carpenter ants are mainly external feeders of other insects and honey dew on plants and flowers. As they trail in and out of the structure, the ants can not detect the product, and pick up small amounts on their bodies and bring it back to the nest, where it is transferred to the rest of the colony by grooming and the sharing of food. There are also excellent gel baits available today that would be applied into cracks and crevices and/or on the exterior foundation where workers are active. The ants readily consume the bait, take it back to the rest of the nest and share it with the rest of the colony. Complete colony mortality is achieved in about two weeks usually, but can take 3-4 weeks in large colonies. To treat a roach problem, it is necessary to comprehensively fog and/or dust all cracks and crevices, pipes, appliance motors, and cabinets in the infested areas. The Pest Pros, LLC will then apply roach bait in the same general areas. The roaches will readily eat the bait and die, as a result. The first step in eliminating a rodent problem is identifying where the mice or rats are entering the structure. Common points of entry include spaces around or under garage doors, cracks or holes in the foundation (where oil and A/C lines enter) and holes in the screens over exterior vents. Within the structure, we look for holes around pipes and wires coming up from the basement or crawl space into the first floor area. The next step is to insert a course grade of steel wool in these openings to at least temporarily stop the movement of the rodents. We then suggest that the owner make more permanent repairs. In our years of experience, we have found that the most effective way to treat a rodent problem is to place a baiting system in strategic areas of the structure (e.g., basement, crawl space, attic and sometimes in the kitchen). If we find that rats are burrowing alongside the foundation of a building, the bait is placed directly down inside the burrows, or placed in stations along the foundation, pets permitting. Larvacides are actually bacteria that kill the mosquito larva without harming any other organisms that may be present in the water. Mosquitoes can easily be found resting on the underside of leaves in low trees and bushes- these areas should be fogged with an enduring insecticide to help control your property. The insecticide kills the adult mosquitoes, and the residue left on the leaves will kill any others that land there. Whether you’re having a special outdoor event or just want to protect your property from mosquitoes, The Pest Pros, LLC is here to help. The only way to remove eggs and larva of Meal Moths is to throw away the contaminated food source. Glue traps that contain female pheromones can be placed in the infested area to attract the male pests, thus preventing mating. A residual insecticide that kills pupae should be applied to the cabinets that housed the infected food. It is necessary to remove all the items from the cabinet before treating it. 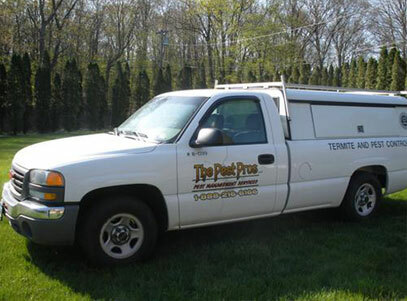 The Pest Pros, LLC offers an effective program to combat the ticks on your property. It will help protect your family and pets from tick borne disease. We recommend four applications per year; early spring, late spring, summer and fall. Primary treatment areas shall include, but are not limited to: all perimeter lawn areas adjacent to wooded areas, up to 30 feet into the wooded area and 10 feet into the lawn area, fence lines, stone walls, brush and wood piles, shrubs, flower beds and ground covers. We also recommend the following steps be taken by clients to protect against ticks; Keep grass cut short, remove leaf litter, brush and weeds, restrict use of ground cover, avoid landscape plants that deer like to eat, move firewood piles and bird feeders away from the home, trim tree branches to allow in sunlight, create a three foot wood chip or gravel border between lawn and woods and locate children's play set in short grass or wood chips, away from wooded border area. Treatment requires a thorough dusting of the entry holes and tunnels. Treatment calls for dusting the nest through its opening. Honeybees are considered a beneficial species. We recommend contacting a beekeeper to solve any problems. Treatment calls for directly spraying or dusting the nest. Treatment requires dusting all individual holes that the wasp makes. The nest has to be sprayed or dusted through a bottom opening. The nest must be dusted through ground openings, or through a hole or crack on the exterior of the building. Bed bugs have recently been added to EPA'S list of pests of significant public health importance. Do not purchase used furniture or mattresses. When traveling, keep suitcases on hard tables, off the floor and closed tightly. Wash and dry all clothing upon return home and keep suitcases in the garage or basement of the home. Keep mattress and box spring protected with a bed bug proof encasement. Install a bedbug monitoring device. Control is usually beyond the control of non-professionals. Prior to treating an area, place all items in heavy-duty plastic bags and wash & dry at a high temperature or dry clean, do not return items to the room until after treatment. Cover all mattresses and box springs with a bed bug proof encasement. Wash all bed linens and clothing in household washer and conventional dryer or dry clean. Residual insecticides including pyrethoids can be applied to cracks and crevices to kill bed bugs in their hiding places. Read labels carefully before treating mattresses. Bed bugs are resistant to some pesticides therefore using a variety of products including dusts and sprays may be necessary. Dusts include silica gels, borats, and pyrethroids. Aerosols specifically formulated to treat bed bugs are available. Bed bug monitors are also available.